Adagio splashed 7 days ago and she is happy to be back in the water and so are we. Here she was on the hard last week and being transported back to the water. We have been busy this last week unpacking, provisioning, and meeting other boaters. 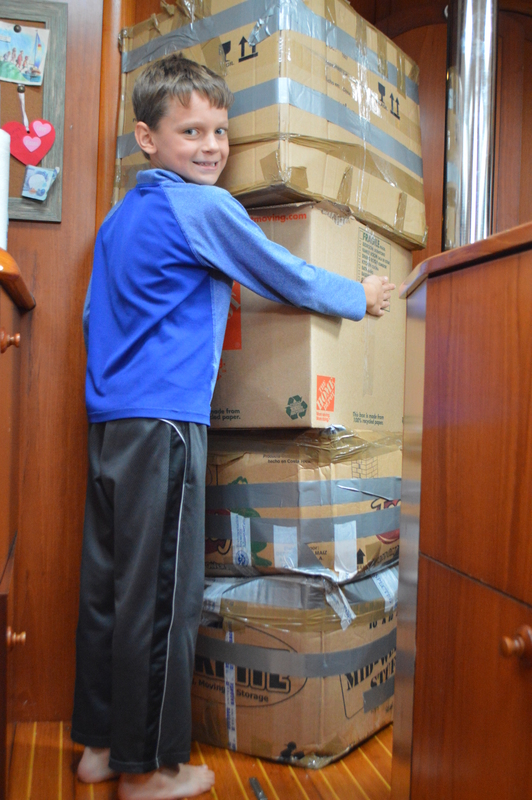 Here’s Camden on the boat with our boxes from Costa Rica. 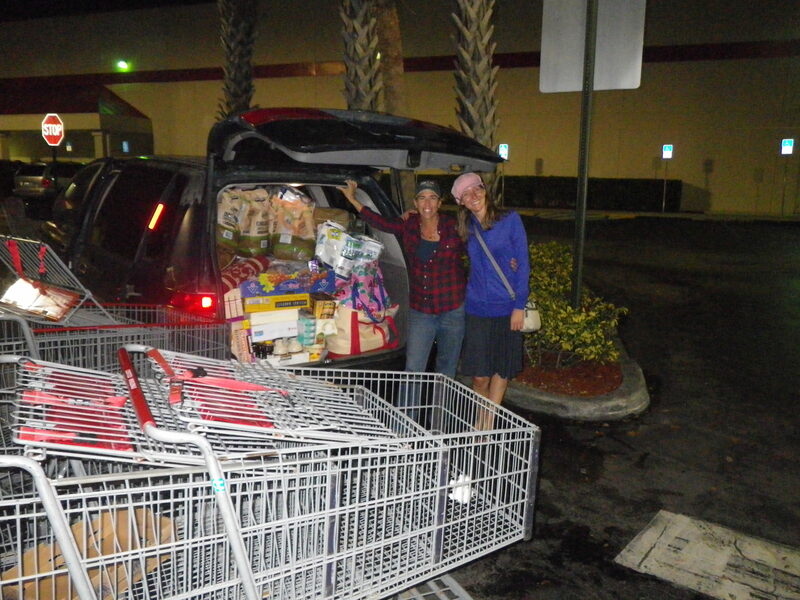 And here I am last night at Costco with my friend Tonya and her minivan. You gotta love minivans for boat provisioning. No surprise, Camden has been busy fishing. As soon as Camden put a line in the water our first day, he caught something! Unfortunately it was just a bag. But he said, “Well, I gotta start somewhere!”. There are two other sailboat families with kids here at Harbourtown Marina. We have really hit it off with them. 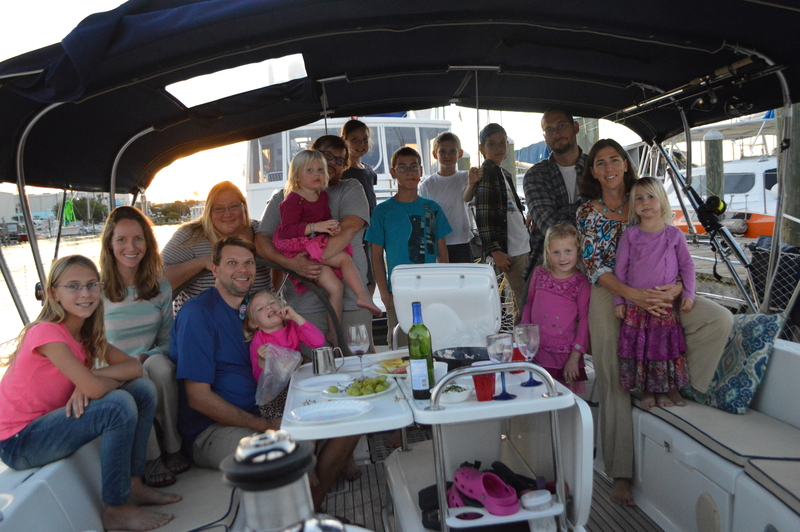 One night we had a progressive dinner starting at our boat for appetizers, then to Take Two for the main course, and then to Lark for dessert. I love the moms from Take Two and Lark. It feels like we’ve been friends forever. April, Tonya and I have so much in common. We are all hippy at heart, are homeschooling our kids, have essential oils on board, use coconut oil for all kinds of things, and so much more! But the best is that the three of us moms agree that living in nature and allowing our kids to explore the world is the best gift we could ever give our kids. I can’t wait to stay in touch with these families and see where the wind takes them. Joellen, Camden and Maria have really hit it off with the youngest of Take Two’s kids. Here is Joellen with her new best friend Sarah. 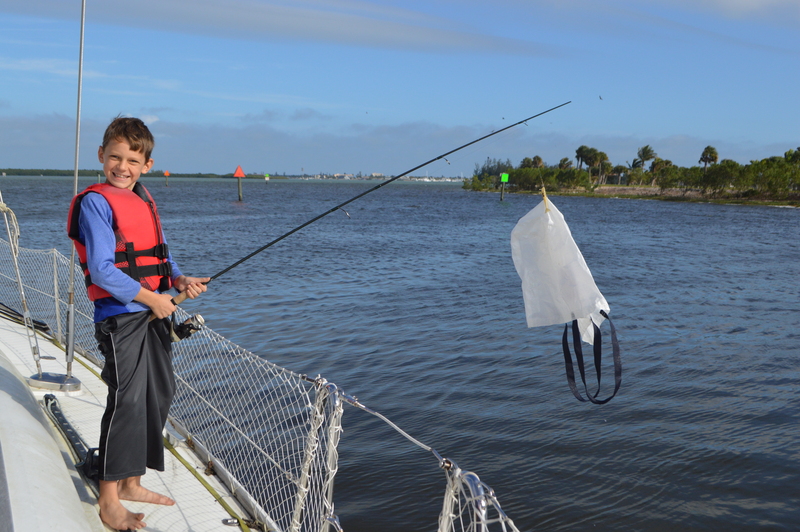 Here is Camden with his new best friend Sam, who loves to fish also. Sam came sailing with us two days ago in the hopes that we’d catch some mackerel, but it was a bust. And here is Maria with her new best friend, Rachel, who is the youngest of five. Both Maria and Rachel are the babies and princesses of the families. Marc’s dad came to visit us for two nights. Luckily the weather was nice so we were able to take him out for a sail. 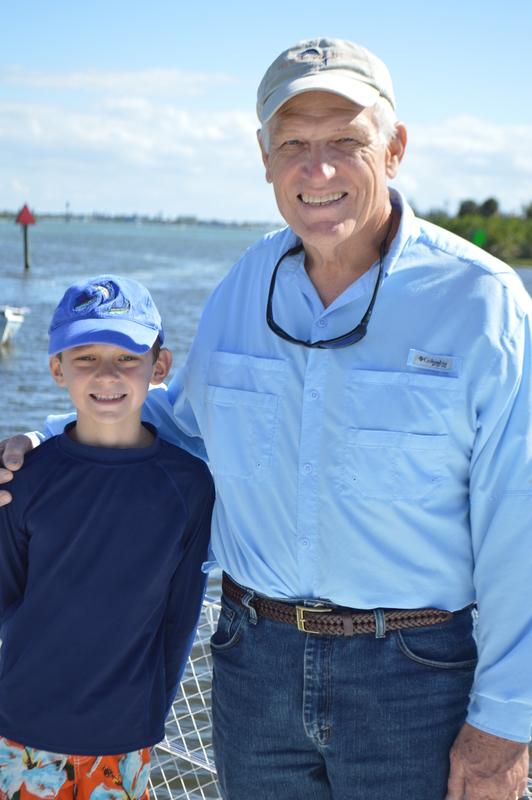 A highlight for Camden this week was meeting up with his angler mentor, Wade, from fishing boat Job Site. Cam met Wade last year in Marsh Harbour, Abacos. Wade took Cam under his wing and taught Cam a lot about fishing. We knew Wade lives in Fort Pierce so as soon as we pulled in town here, we called Wade and he came over to spend some time on our boat. Wade stated it perfectly when he said, “Cam and I…we’re kindred souls.” Cam savored every minute of having Wade aboard. We also have been busy cleaning. Adagio got really dirty while being dry docked in the boat yard. But my girls are like me and love to scrub. I’m so proud. Homeschooling is going great. Even Maria wants to participate now which is really fun. We won’t get any homeschooling done for a few days later this week when we are sailing to Miami, so we are getting in extra schooling now. What’s next: One of our best friends from college, Zach Frank, is flying here today and will sail with us down to Miami tomorrow. It’s been pretty chilly so Zach is bringing us extra hats and gloves for our night passage. It should take us about 23 hours to sail from here in Fort Pierce down to Miami. I just looked up online how long it would take us to get to Miami by car and the answer is 2 hours and 6 minutes. But it’s the journey, not the destination! We don’t mind sailing through the night with just Marc and I, but having Zach on board will make the night watches easier and definitely more entertaining. Are you in Miami, call me, love to come an see you. Wonderful pictures! So excited for you guys. we miss you but we can’t wait for more updates! Everyone looks so happy and healthy!! So sorry we were not able to hook up with you when we were in Florida…looks like you were busy!! Love to all! Sheri, I’m sorry too. We were super busy. But we will see you next summer when we come to Indy to visit. I was comparing pictures from last year this time and have to say–Everyone is looking fine! The youngsters have changed so much; growing up! Looking forward to adventures on the water this time around! Smooth sailing!! God Speed! Thanks Mrs. Kimball. I am honored you follow our blog. Blessings to you always. Ha, ha! Love it! Like daughters, like Mama, like Grandma with the cleaning 🙂 Love to see that Maria continues to sport the hair accessories!!! Looks like all are doing beautifully…hugs and kisses!! !